It’s like wearing a tiny electric chair on a chain. That’s how a pastor at our church once described the offense of the cross of Jesus Christ. He was talking about how something so dear to us as Christians because we know what it means for our salvation, and which many of us wear around our necks as a symbol of our faith, can appear utterly ridiculous, disturbing, and contemptible to others. 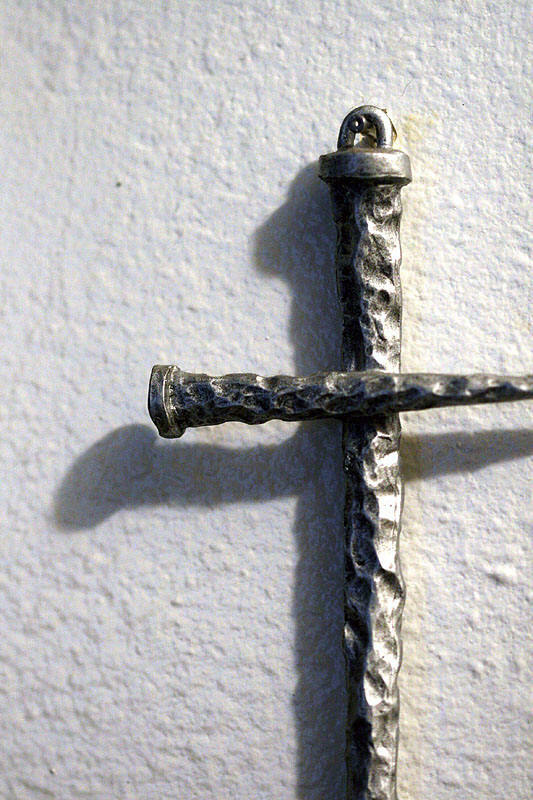 What is it about the cross that acts as a stumbling block to unbelievers? Growing up Roman Catholic, a crucifix was never far from sight…in our home, on the walls at school, and of course in larger than life magnificence every Sunday morning at church. And not only was I getting the same visual at home, school, and church, but also the same message of Jesus crucified for the sins of the world. So I never really questioned it nor saw it as odd or offensive. But for those with a different upbringing, I can see where the cross, and indeed the wh ole message of the Son of God dying as an innocent sacrifice for others, might strike one as a bit repulsive. Let’s look into some possible reasons why. It’s human sacrifice, for cryin’ out loud. How savage and barbaric is that? It smacks of a creative fable born of desperation, a fanciful reshaping of a horrific failure into a story of heroism, redemption, and victory. It’s humiliating, not so much for Jesus (which it was), but for us. What kind of incorrigible sinners are we that our salvation necessitated such a despicably dastardly deed be perpetrated on the very one against whom we sinned? It provokes our self-righteousness. We think we can get to heaven on our own merits. Indeed, the cross is offensive and a stumbling block; the Bible even says so.1 And the same Greek word ‘skandalon,’ from which we get ‘scandalous,’ is translated as both. The cross of Jesus Christ is scandalous to those who misunderstand its sacrificial nature and are unfamiliar with Scriptural passages like Isaiah 53 that foretell the “Suffering Servant” and Jesus’ own teaching that he would die for the sins of the world. It is “disgraceful, shameful, shocking, or improper” (so the definition of scandalous) to those who think themselves quite moral and law-abiding and able to rack up enough heaven points on their own, thank you very much. And a scandal to those whose familiarity with Jesus begins and ends at the crucifixion, and who never look beyond to the resurrection, much less his return in glorious victory at the end of the age, thinking him just a first-century loser. Today is the day we remember Christ’s death on the scandalous cross – Good Friday. When I was a child I thought it was a bit of a joke to call the day “good.” And I imagine a lot of skeptics and unbelievers think likewise. The day was so solemn in tone and mood, and the event commemorated so heavy and sad. It may be that ‘Good’ Friday evolved from its earlier designation as ‘God’s’ Friday. That makes sense. But nevertheless, the simple yet unmistakably positive descriptor ‘good’ for a day remembering an event that was all suffering, pain, evil, and injustice in the physical realm, is not a misnomer or sick sarcasm. Because in the spiritual realm, justice reigned, evil was conquered, and eventual and eternal freedom from pain and suffering was secured for those who believe. And that is where the stumbling block that is the cross will be removed. The crucifixion of Jesus Christ and his subsequent resurrection is as one insuperable event, both in the physical realm and the spiritual, never to be surpassed or repeated. But it is in the spiritual where its efficacious significance is realized. Because we ourselves are not just physical but spiritual as well, and it is in navigating the spiritual that the barrier is removed. Once it is, the cross can be seen for the power and wisdom of God2 that it represents, and our way to him who hung on it will be unimpeded. The post was originally published in April 2014. ← What are we to make of this Jesus fellow? Thanks, Caroline. Yes, and Jesus is no longer a sacrificial victim but presently sits at the right hand of the Father offering the free gift of salvation to all who accept Him.